The perspectives of Russian President Vladimir Putin and U.S President Barack Obama on Syria are so different, you have to wonder if they are living on the same planet. Putin's public rationale for intervening in Syria and backing President Bashar al-Assad boils down to a case against failed states. “After the invasion [of] Iraq, the authorities were destroyed, Saddam was hanged, and then the ISIL came there," Putin told interviewer Charlie Rose. "And what happened in Libya? Full disintegration, no state at all….We don’t like the same thing to be repeated in Syria." In other words, when Western democracies take down despotic, human-rights-abusing strongmen, the result is chaos and terrorism. From Obama's perspective, "When a dictator slaughters tens of thousands of his own people, that is not just a matter of one nation's internal affairs — it breeds human suffering on an order of magnitude that affects us all….Let's remember how this started. Assad reacted to peaceful protests by escalating repression and killing that, in turn, created the environment for the current strife." Both leaders call for a diplomatic solution, with Putin supporting Assad and Obama calling for a managed transition away from Assad. Both leaders are using air assets to bomb "terrorists," although Obama is going after the Islamic State (ISIS or IS) and Putin is targeting anti-Assad rebels. Both are supplying their proxies with training, arms, and supplies -- as are Iran and Saudi Arabia. Neither leader is pursuing a policy that will bring an end to the conflict or help Syrians who are caught in the middle. Their train-and-equip strategies often make murderers out of otherwise decent people. And no nation can protect innocent civilians from 60,000 feet. Both leaders are using self-defense as their primary legal justification for their actions. But without UN Security Council approval the concept is being stretched to the point that self defense has become a meaningless term for any aggressor to use at any time. It's past time for a radical solution to this metastasizing conflict. Syria has not lived up to the responsibilities of a sovereign UN member state that accepts the obligations contained in the UN Charter. With sovereignty comes responsibility. And the most important responsibility a country has is to protect the people living within its borders. Although many nations have crossed this line in the 70 years since the UN's founding, Syria under the Assad regime is a particularly heinous example. The Syrian conflict threatens the peace and security of the entire world. 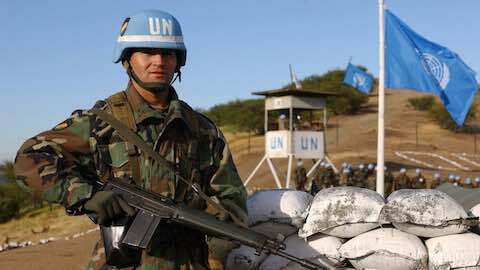 Perhaps it's time to use the UN for its founding purpose: to end the scourge of war. The other 192 UN member states, including Assad's allies Russia and Iran, should suspend Syria's UN membership, which can be done under Article 5 of the UN Charter. Then the territory should be placed under the auspices of the UN's Trusteeship Council, a moribund UN organ that basically went out of business when the last of the colonial countries achieved independence. Let's breathe new life into it and use its chamber as intended rather than as just a glorified conference room in the UN's headquarters. The Syrian conflict is a very complex multi-party conflict. If there's another way to provide the diplomatic space needed for a political solution, I have not identified it. Some colleagues have already reminded me that the UN has never solved a high-stakes geostrategic conflict. And utilizing an obscure multilateral mechanism that will involve a highly unusual revocation of sovereignty is close to impossible. However, the UN's universal membership and legitimacy can provide an umbrella under which the Assad regime and non-IS Syrian rebels, the Iranians and Saudis, and the United States and Russia find the means to halt IS's barbarous advances and allow Sunnis, Shiites, Kurds, and others to live alongside each other without a strongman imposed peace. Activating a new UN International Trusteeship System could temporarily place Syria under the trusteeship of a to-be-determined nation. It could be the United States, Russia, or more likely a mutually-agreed-upon state with enough capacity to take on the challenge, such as India or Japan. The Trustee would establish a provisional government that allows all parties to the conflict that eschew violence to participate. This could permit current Syrian government, moderate rebels, and international forces to focus on halting IS's vicious campaign. It could create the space for a political settlement of the conflict. Perhaps it could even be structured in a way that gives Assad a face-saving role in the provisional government and yet defangs his ability to slaughter Syrians. Actions to hold Assad accountable for his crimes against humanity would most likely need to be deferred until a more peaceful and just Syrian state is reestablished. To begin the process, all the UN Security Council permanent members -- Russia, China, Great Britain, France, and the United States -- would first have to agree. Although Russia and China have vetoed many Security Council votes aimed at the Assad regime, they could very well see this as a solution to an intractable and costly problem that enables them to retain influence in the region. From Assad's perspective, the fate of failed dictators, like Saddam Hussein or Muammar Gaddafi, could motivate him to accept a soft landing provided by a UN trusteeship, particularly if his primary benefactors were pushing him to do so. This alternative would also give him the space to let go of the reins of power in Syria. From Putin's viewpoint, a trusteeship scenario would allow Russia to maintain influence in Syria and at the UN and avoid consigning Russian troops to an Afghanistan-like quagmire. If Putin's goal in intervening in Syria was "to get attention, then it was brilliant," according to one senior US official. "If it was to end the fighting in Syria, that's where we think it's a strategic error." Despite Putin's diplomatic maneuvers at the UN in September, he was unable to enlist any new nations to be part of his anti-IS coalition. A UN trusteeship administered by a "neutral" nation could attract many more countries to contribute forces to help stabilize the region. For President Obama, a new UN Trusteeship System would provide an alternative to a scenario with no successful solutions in sight. There are already indications that some top White House advisers and National Security Council staffers are trying to persuade Obama to decrease US engagement in Syria and temporarily accept the legitimacy of Assad's regime. Other senior staff have proposed deploying Special Forces for the first time in Syria. Neither option leads to a near-term political solution without severe consequences. If Obama or another world leader proposed the Trusteeship scenario, a veto by Putin would weaken his position and the very thin veneer of legitimacy surrounding Russia's Syrian intervention. For both leaders, reframing the international response in Syria would reduce the risk of igniting a new Cold War and the possibility of their forces operating in Syria and Iraq accidentally engaging each other. Leadership at the UN would provide the US and Russia the global respect that both nations crave and deserve. In the end, peace in Syria (and the surrounding region) will take good governance. Creating the political space to establish it will require the international community to make a significant long-term commitment of military force and resources. Bombing campaigns have already proven to be insufficient to stop IS. Depending on local troops to maintain their own security, even with the best training and equipment, has not worked in Iraq or Afghanistan. In Iraq, the leadership is reported to be "corrupt, taking bribes to let people go on leave, and that they abandon troops when the battle heats up." The resurgence of Taliban attacks in Afghanistan has already prompted NATO forces from Germany, Turkey, and Italy to agree to maintain their current force levels alongside the 10,000 U.S. troops stationed there. Neither the US nor Russia can sustain the kind of political will needed to deploy and maintain sufficient forces in Syria to stabilize the country. Former CIA Deputy Director Michael Morell believes it would take 100,000 troops to destroy IS. It could take a commitment on the magnitude of the deployment of U.S. troops to Europe and Japan after World War II to stabilize Syria, establish a provisional government under a trusteeship, and create conditions for a peaceful society. No one nation or coalition is ready to make such an investment now. But there is globally a huge reservoir of armed forces that could take part in a UN-sponsored operation to establish a trusteeship and get the job done. Not including Russian, Chinese or Iranian forces, the militaries of countries listed as "Free" in the 2015 Freedom in the World report have around 10.2 million troops. Collectively, the international community has the capacity to contribute enough forces to send a clear, resounding message that the use of violence, to gain or maintain power, will not be tolerated. Ideally, UN Security Council and General Assembly resolutions that would authorize temporarily placing Syria under a trusteeship would also commit each member state to contributing some forces to help stop IS, stabilize Syria, and provide the territory with peacekeepers and police while in transition. Given IS's transnational character, the UN-authorized alliance would need to operate, with some approval from host states, outside of Syria as well. This will work if the majority of the international community participates. For Saudi Arabia and Iran, although there wouldn't be a clear winner or loser, both nations would benefit from defusing a costly regional conflict that threatens to engulf the Middle East in a larger war. The United Nations works best when nations are united. To date, divided national priorities have not allowed the 70-year-old institution to play a significant role to end war in Syria. Promoting a new Trusteeship System to address this problem could be a way to bring nations together to focus on the limits of sovereignty and the responsibility to protect civilian populations. For the 7.5 million Syrian children who have been brutalized by this war, for the estimated 9 million Syrians who have fled their homes since 2011, and for the hundreds of millions in Europe and around the world who are wrestling with a growing refugee crisis, isn't it time for a radical win-win solution for Syria? "A Radical Win-Win Solution for Syria"